Regular blog readers will possibly remember my previous Susan Cattaneo feature. Since then Susan has released another album, entitled Little Big Sky. At only seven tracks this album is shorter than her previous two and also definitely has more of a country feel. My favourite song from the album is the title track Little Big Sky. The instrumentalisation is heavier than some of Susan's other tracks but she does well throughout the song and it allows her to display a rockier side of her voice. It's a song that makes you want to sing along and I have found myself repeating it multiple times. Another strong song is Better Day. The song builds up really nicely throughout and contrasts well with some of the more up-tempo songs such as Little Big Sky and Let The Music Deliver Me. The song also serves to showcase Susan's impressive upper range. Whilst it is hard to decide, my least favourite song is Spare Parts. It is good to have a mix of tempos on the album however I feel Susan has better upbeat songs and there is nothing in the song that particularly sets it apart for me. 1) You currently teach at the Berklee songwriting department, how do you balance that with your performing? It’s always an interesting balance between my day job and my night one. Luckily for me, both are related to music, and I think they both play off each other in really wonderful ways. As a teacher, I’m able to speak to my students about what being a working musician entails: from stage performance to touring to booking gigs and networking. As a performer, I think being immersed in music analytically helps me as a songwriter, because I’m always examining songs and figuring out what makes them work. 2) Which song do you wish you had written? One of my favourite all-time songs is Little Green by Joni Mitchell. The construction of the lyric, the melody and the form of the song is as close to perfect in my opinion. The first two lines of the chorus get me every time: “Just a little green/Like the colour when the spring is born”. That is songwriting at its best. 3) Which artist from any genre would you like to collaborate with? Well, speaking of Joni, I certainly would like to work with her. And other songwriters I love are Lori McKenna, Greg Barnhill, Lyle Lovett, Matraca Berg and Kim Richey, …so if I had my way, I’d write and perform with all of them! 4) Your latest album has more of a country feel to it, what made you want to try that? I’ve spent a bunch of years writing with artists and songwriters down in Nashville, and while I’m not from the south, the storytelling in country music has always held appeal to me. I also grew up spending summers on a working ranch in Arizona, and I think that’s where I first heard and loved country music. 5) What music are you currently listening to? During those summers in Arizona, I was exposed to a lot of old style country music, and lately, I’ve really been enjoying Willie Nelson and Emmylou Harris. But I’m also listening to music from the Americana world – Gillian Welch’s The Harrow and The Harvest. It’s a sad but very beautiful album. 6) Is there anything you haven't done in your career that you would like to? So many things!! I love playing gigs and would like to continue to build an audience locally and also expand nationally. I’m an okay guitar player, and I am definitely working hard to get better at that. So, one of my goals is to become a better player, a better soloist. And I’d like to open for any one of my musical heroes: Bonnie Raitt, Guy Clark, Wanda Jackson, Buddy Miller, Emmylou Harris, and Susan Tedeschi. 7) What venue would you like to perform in that you haven't yet? I would love to perform in England! I haven’t toured there yet, and I think it would be wonderful to get a gig at the Royal Albert Hall!! I’m torn – can I choose two favourite things? First of all, I love the songwriting – the craft part of the job can be challenging but so rewarding when the song is completed. Second, the performing is a blast! I love getting up on stage, and I am incredibly grateful for the chance to play my music for people. The business part – I hate all the logistical stuff that has to go on behind the scenes to keep a music career rolling. I wish I could just write songs all day and perform all night, but the life of a musician runs on the nuts and bolts of the business. 10) What would you say to someone wanting to make it as a musician? I would remember that it’s a marathon, not a sprint, and that every time you hear about someone having overnight success, chances are that that artist spent years toiling in obscurity until their “break” happened. I don’t believe in “luck”. I believe that hard work puts you in places where opportunity can happen for you, but it takes time, patience and experience. Every gig is important whether you’re playing to one person or 1,000, because you’re learning something every time. 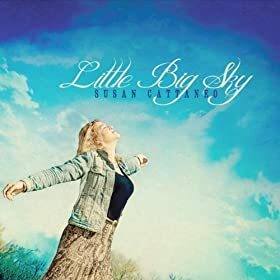 Even if you didn't like Susan's previous albums I would definitely recommend checking out Little Big Sky, it is certainly different from her previous albums. Having expressed a wish to perform in England I hope we get to see Susan over here soon!